The deep sea exists at this time as it always has, a virtually lightless zone where dead matter rains down from above. Due to the ecological upheaval of the past 600 million years, the inhabitants of this abyss are very different, but they share many of the same techniques that existed in our age. Bioluminescence is common, as is dark or reddish coloration to serve as camouflage in the low light. As with our modern abyss, many of these forms appear strange and even terrifying. ​Angler squidjets (Lophoteuthis sp) are middle-sized squidjets that range from the midnight zone into the abyss. Measuring up to 30 centimeters long, with powerful horny-toothed jaws, the anglers hover vertically in the water column with their glowing mouth lure exposed. As soon as prey comes to inspect the lure, it will surge forward by jet propulsion and seize it, often impaling the prey on its large “teeth”. 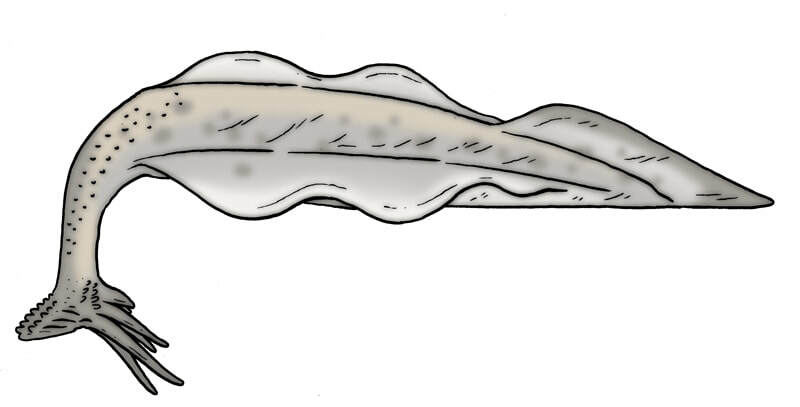 Twinlight slugfish (Biluminolimax sp) also have twin lures, but are somewhat more active predators, cruising slowly and methodically around in the hopes of stumbling upon good hunting grounds. Any prey that wanders attracted into its field of light will be chased down and consumed, so long as it is not too big. Twinlights grow up to 35 centimetres long. ​Living along the sea-floor in the very deepest parts of the ocean, the Noonoo (Aoptahlmus hoover) is a kind of slugfish, which is completely adapted to catching small animals living on or hiding in the sea floor ooze. Its face is pitted with chemoreceptors, and it is completely eyeless, blind. The mouth bears long, sensitive feeding tentacles, which are also replete with chemo-and-mechanoreceptors; the whole array is mounted upon a long proboscis. Noonoo move slowly and sedately along, just above the seafloor, by undulations of the fins that form a fringe along its sides. Prey is captured relatively swiftly, by a concerted effort of the feeding tentacles and the horny teeth inside the mouth. Noonoo usually reach about a meter long, but older individuals can reach 1.6 meters. Fishing eelorms (Peschevermis longus) are another predator which has glowing lures to attract prey. These eelorms measure up to 80 centimeters long, and hover motionless in the water, twitching its twin lures to attract prey. When the prey wanders close enough, it snatches them in its wicked jaw-tipped proboscis. This kind of eelorm can detach one of its lures to distract an attacker if it is pursued by a predator. Slimesweepers (Mucosavermis umbellatus) are deeps-ea abyss dwellers related to both Fwirms and Eelorms, being descended from Polychaete worms. These swimming worms are blind and do not possess all that many senses besides the mechanoreceptors that alert it to oncoming danger. They will swim slowly along for days on end, trailing their large, paddle-shaped feelers, which bear a large veil of glutinous mucus. It feeds by accruing edible detritus like marine snow, which gets stuck to these mucous-coated organs. Regularly every few days, the Slimesweeper will retract its feelers and eat the mucous coating, and all the food that has stuck there. Red barons (Amphiastacus sp) are large descendants of marine amphipods, reaching up to 15 centimeters long. The number of body segments and limbs, and their configuration, has changed drastically compared to their ancestors. They cruise in small shoals of up to 20, mainly in the midnight zone, seeking small bioluminsencent invertebrates to catch and eat. Red barons inevitably fall prey to larger and more ferocious deep sea predators, such as fishing eelorms and various deep-sea trapmaws in particular. Snaggletooth trapmaws (Procumboagnatha sp) are wicked-looking creatures measuring only 25 centimetres long, having a truncated body adapted for short bursts of speed, and extremely long horny teeth projecting from the jaws. Snaggletooths have 2 pairs of light emitting organs that serve to attract prey. They mainly inhabit the abyss, and glide slowly through the water, waiting for light-seeking prey to wander close enough to catch. Prey is swiftly caught and impaled in the large snaggle-toothed jaws; the stomach of this animal can expand to accommodate fairly large prey. Red barons are a common prey item of this creature, though undersized individuals are sometimes preferred. Midnight trapmaws (Phoboagnatha sp) are moderately large for a deep sea species, reaching up to 1.3 meters long. They mainly inhabit the midnight zone but do sometimes range into the upper layers of the abyss. 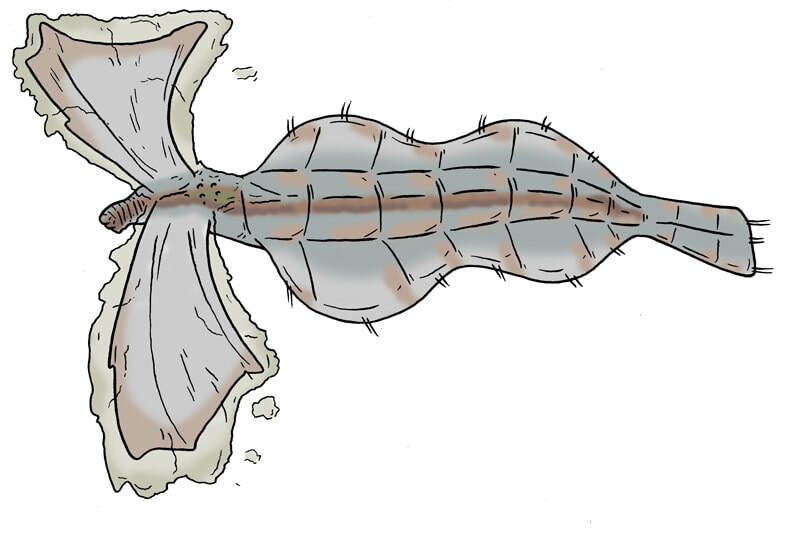 These trapmaws cruise along efficiently by undulating long bodily fins, hoping for light seeking smaller predators to be enticed by their light producing organs. Its jaws are large and formidable, bearing a trap-like array of huge, curved horny teeth; prey is usually killed outright when seized. Phantom Asterotheres (Abyssothera mandibularis) are large Asterotheres (about a meter long) which occur in the Abyssal zone of the deep sea. Their various arms and tube-legs have become rounded paddles that allow it to swim and drift passively in the water column, as it waits for prey to happen by. The front pair or arms form large, trenchant grasping mandibles with which it snatches and kills its prey, the eyespots are large and sensitive, and its body is covered with chemo-and-mechanoreceptors to sense the approach of prey.